My husband’s Grandma asked me to bring fruit to the family Easter gathering. She wasn’t specific, and not being a really enthusiastic fruit eater, I was a bit stumped on what to bring. So I did what any modern day woman would do. I looked around on Pinterest. Several hours later, I found a great recipe for a super simple fruit salad. I adapted the recipe I found from a wonderful website called Southern Bite. (See the original Secret Ingredient Fruit Salad recipe). And when I say it’s simple, it really is. It can be a frugal recipe, too, depending on whether the fruit is in season. Since I procrastinated and most of the fruit was NOT on sale, this wasn’t a cheapskate potluck pleaser, but it was definitely enjoyed by all who tried it. Wash the fruit and make sure it is dry. Hull and slice the strawberries. Mix together the blueberries, strawberries and grapes and then pour the can of peach pie filling over all the fruit, tossing gently to coat it. Chill the fruit salad for about an hour before serving. 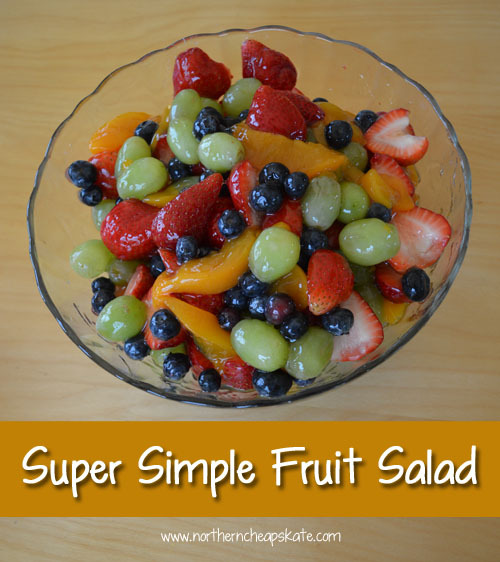 This was a deliciously sweet, and super simple fruit salad. It’s definitely on my “must make again” list for potlucks and family gatherings as it doesn’t take any time at all and looks beautiful, too. We had a little bit left over that we ate the next day – still good – but definitely tastes best on the first day. I would imagine that this would taste good with other fruit, too. It would be fun to experiment with what’s in season. It’s hard to go wrong with a fruit salad! It seems to be one of those things that everyone likes. :) I’ve never thought of including pie filling! Stacey Little lives in my town! We just this past Saturday attended the Alabama Book Festival and I purchased his cookbook there. It is awesome and chock full of recipes that I can’t wait to try. Plus I love his family stories about the recipes and how he “tweaks” them too. Our son lives in PA at present. I’m planning on giving him Stacey’s book for his birthday in Sept. It will be a little bit of “home” up there in Jim Thorpe. That’s awesome, Debbie! I’m relatively new to the site, but I’m definitely liking what I see. I will have to check out his cookbook!